It has been a very long time since I�ve written a review, but this evening over a glass of Bailey�s (maybe that had to do with my decision-making) I thought it�d be nice to dust off my badge and take it for a spin. (Also so no one thinks about demoting me D:). Browsing through the Featured Games page, I, like most others, tend to focus on the thumbnail of the games I see, and one caught my eye in particular - Grey Shadows, by yellowwaffle. bleep, did that thumbnail look intriguing - a creepy shadowy cavern whose artistic design makes it look like it�s fading away into the horizon. My curiosity, piqued, I clicked on it and played the game to the end. It pains me to say this, but based on the experience I had and the feedback I�ve been seeing from others...it�s overrated. Very overrated. Is this the standard for games now? It can�t be, since the other games on the Featured Page are equally substantiated in all aspects; so I can only assume it was featured because of its aesthetic minimalist art design. By no means is it a bad game; it was just lacking. Imagine staring at a painting - pretty to look at, pretty to look at, and it�s also...well...it�s um...pretty to look at. That was to the extent to which I enjoyed the game - it gives you the same kind of pensive, melancholy contentment you get while admiring art at a museum. Some might call this sort of experience �unique� or �refreshing,� but ultimately I wanted to have a satisfactory gaming experience, and Grey Shadows simply didn�t give me that. The story is practically nonexistent. The description cryptically claims that you are a �wandering spirit� who has awakened from �years of sleep� (guess it kind of failed in the �wandering� department), and that you are exploring �what happened in your absence.� I�ll cut the game some slack, since the Physics creator doesn�t allow for the same narrative scope that the Platformer or even the Shooter creator possesses, but the game doesn�t even attempt to expand the story beyond �...� or �oh noes a spirit�. I�d appreciate some form of flow or progression, but...but hey, it�s pretty to look at! The gameplay is, unfortunately, mostly a bore. 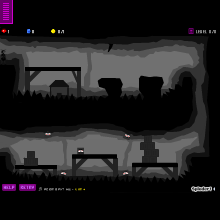 The levels consist of �Get from Point A to Point B without dying.� Very little variation, apart from a scattering of collapsing platforms or falling stalactites that really only serve to keep the player wary, but even that doesn�t work as half of the time you can see them or predict when and where something�s going to happen. Flat open space ahead? Better tread carefully - OMG a spike!!1! Phew, good thing I guessed that was going to happen! I�ll give yellowwaffle credit for this though: he managed to construct a well-executed boss battle. The spirit, although designed a bit strangely, behaved like a boss one would come across in an actual video game. Even I haven�t entirely figured out how to emulate the life-like, swaying motions that are often exhibited in PPG bosses. Despite being a bit monotonous, it still was a welcome change of pace. Wow, NPC, you must be one salty old crone, bleeping and moaning at a five-minute game on www.sploder.com. Is there anything you liked about this game? Well, as I mentioned before, the art design is by far the best part. yellowwaffle took full advantage of the colors and effects the Physics creator has to offer and produced a minimalistic, dark, visually appealing landscape that is oddly reminiscent of the exaggerated angles and chromatic contrast exhibited in pre-Depression noir films (!dork alert!). Ledges and ceilings fade realistically into the background, and chasms are studded with spikes and a few dead bodies to emulate a mysterious shadowy cave. Spirits - the prefab Physics face, only gray and complete with bleeding eyes and strained smiles - creep eerily from behind structures. The music, although a predictable choice, still complements the scenery beautifully - I always thought that the dark ambient music available for Sploder sounded nice (Chromozone is my favorite). So overall, did this game deserve its feature? No. Once you got past the dark, well-designed scenery and backgrounds, the gameplay is short and boring, the story seems phoned-in, and overall it adds up to a disappointment. It feels more like a demo for a larger game than anything. One could argue that this review only proves that it�s the creator, not the gamemaker, that�s hindered, but I would direct you to Shadross�s �Lectred Z� saga - massive, well-designed, and with a substantial story to boot. If I had some advice to offer to yellowwaffle, I�d say add more gameplay elements to make the experience feel more whole and enjoyable, but don�t stop making them look amazing. Play only for the art design; otherwise, it's not worth your time.